Famine and war both tested the strength of the Bank of Ireland. In last month's article, we talked about changes to the banking system of Ireland due to an inadequate economy for a growing nation. The Bank of Ireland was successful in the area surrounding Dublin, but the small banks were not able to meet the demands of the cities outside of the Dublin area. In the 1820s, banks acts were passed that allowed Joint Stock Banking to establish itself in Ireland. New banks such as Ulster Bank, Belfast Banking Company, Northern Bank, and Provincial Bank began to spread all over Ireland. England noticed the success of new Joint Stock Banking in Ireland and wanted to take steps to gain more control over the Kingdom’s note issuing privileges. The Bank Charter Act of 1844 fixed the number of notes allowed to be issued by the banks in England and extended this to Ireland in 1845 with the Bankers Act. The act of 1845 allowed notes to be issued in Dublin by banks other than the Bank of Ireland and required gold backing of excess money issued by banks. These new acts limited the control any one bank had over the monetary system and weakened the position of the Bank of Ireland to address any economic problems. The country was prevented from addressing monetary crises, as no one bank had enough control to influence the Irish monetary system. The power over Ireland’s system rested solely in England. The Great Famine of Ireland that started in 1845 changed things for the banking system. The famine was a result of much of Ireland depending on potatoes, when a blight ravaged the potato crop leaving hardly anything for people to eat. The effects of the famine were felt immediately by the people of Ireland, but England was slow to respond. In the first couple of years, the Bank of England did not step in to help Ireland due to lack of heavy business in Ireland leading to minimally perceived economic effects. The Bank of Ireland provided public works and asked for more silver as its supplies quickly ran out. England agreed to help Ireland, but it had Ireland take a loan against its property and raised its interest rates. These actions, along with the ongoing poor harvests of potatoes, caused the panic of 1847. The outflow of gold caused many institutions to raise their interest rates in order to justify loaning in turbulent times. After seeing the panic, England lifted their recent act of 1844 nullifying the requirements of banks to back excess notes with gold. This alleviated the run on the banks, but the effects of the famine would continue into the 1850s. After the famine subsided, Ireland began to recover and grow. Even with another famine and the panic of 1873, Ireland’s banking was able to expand. By the early 20th century, nearly 600 new branches for banks had opened. Europe in 1914 entered turbulent times when Archduke Franz Ferdinand of Austria was assassinated. Much of Europe had a run on the banks due to thought of imminent war. England and Ireland were no exception. England passed the Currency and Bank Notes act one day after declaring war on Germany. 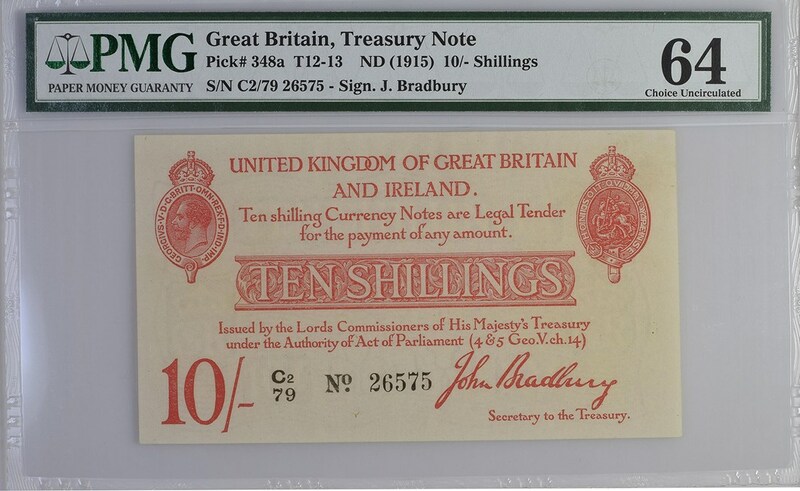 The act granted power to the Treasury to print its own notes for people of Britain and its countries to turn in their small denomination coins for paper equivalents. England did this in order to secure what precious metals were in circulation. By issuing notes through their treasury, it buffered the Bank of England and its other countries from a more severe economic crisis. The gold standard remained in place during the panic of 1914 but it was nearly impossible to redeem notes for gold, as the act stated that the Treasury could redeem notes “as they think fit.” These notes were in effect until the Currency and Bank Note Act of 1928, which made these notes redeemable by the Bank of England. The Anglo-Irish War lasted from 1919 to 1921. The result was Ireland being split into two: Northern Ireland and the Irish Free State. These newly formed political entities would have to endure another World War and adapt to a modern world. Look for next month’s article to find out how Ireland’s banks became the banks we recognize today.